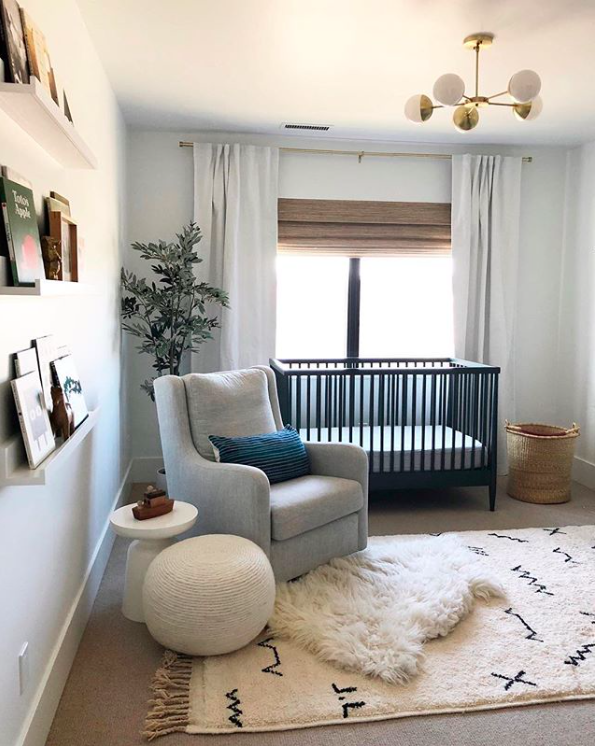 Decorating a nursery for the first time feels like a rite of passage for any new parent. It’s a really exciting time when you’re expecting your first baby and you want to make everything as perfect as possible. And toddler rooms, oh my, is it possible for bedroom designs to get even cuter than a nursery…apparently so! For a newborn, everything is exciting and they very easily get over-stimulated which makes it hard for them to calm down and fall asleep. So keep colours muted, especially near the cot. 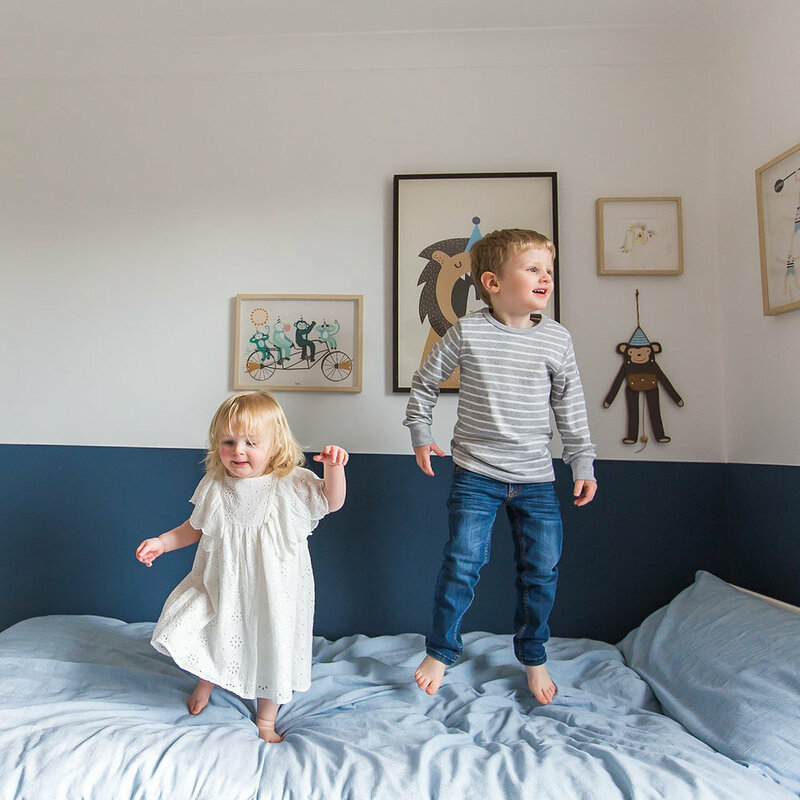 Brightly coloured murals or wall decorations are a lovely addition to a baby’s room, but keep them away from the cot, they don’t need to be staring a giraffe in the face at close range when they’re trying to fall asleep. Likewise, brightly coloured cot mobiles are fab for when you need to park your baby somewhere safe and interesting while you fold laundry, but it won’t help your baby unwind and go to sleep. So if you want one, get one that can be easily removed for naps and bedtime. An older child can handle a more brightly coloured room and interesting wall decorations near to their bed. What they can’t handle though is seeing all their favourite toys just sitting there asking to be played with when they’re trying to be good and go to sleep. Toys should be stored so that they’re not on display, and bedrooms should be neat and tidy at bedtime. It’ll be hard for a little boy to fall asleep with a dinosaur battle going on in the middle of the bedroom floor and clothes strewn where they were thrown off. Tidy up before bed then start fresh again the next day. Little people need darkness to sleep well. Your child’s body (and yours for that matter) produces melatonin when it’s time to go to sleep, and this hormone helps them to fall asleep and stay asleep. The production of this hormone is impaired by light, especially blue spectrum light, so it’s important to keep light levels low in the hour before bed and then as dark as possible through until morning. To make matters worse kids are hardwired to wake early, so in order to try and get them to sleep past dawn we need to keep the morning sunlight out of their room and prevent it from effectively dissolving all of that lovely melatonin which has been keeping them (hopefully) nicely asleep all night. So, what does this mean in terms of bedroom design for your child? Blackout and more blackout is what it means! I always advise parents of early risers or troublesome nappers that they should go for a double layer of blackout on their child’s bedroom window. I’m talking blackout roller blinds set within the window recess and then the blackout lined curtains of their choice over the top. For a young baby who is still taking night feeds you need to consider how you’re going to light the room enough to feed them but not enough to wake them up fully and impact their melatonin production. The answer to this one is thankfully quite simple, just replace the bulb of a small lamp with a red bulb. Red light is the opposite to blue light and will have the least impact on the production of melatonin. For older children you should avoid using night-lights if possible so as to keep melatonin production as high as possible. If they absolutely won’t sleep in the dark, then use a dim red night-light as above but keep it away from their bedside. Young babies can sleep through lots of background noise but as they get older they’re more easily disturbed by household noises. This can have a big impact in the early morning when a parent gets up early for work, traffic noises begin to build outside, or the birds start singing their dawn chorus. In order to encourage longer sleep you need to drown out these noises, and a great way of doing that is by using white noise. You can buy white noise machines or if you have a spare device you can simply download an app. The nice thing about white noise is that it’s portable and when you travel it can instantly make a new environment seem more familiar. If you use white noise it should be quite loud, up to 50 decibels (you can download an app to check the sound level), and it should be used all night long so that there is complete consistency in their environment from start to finish. 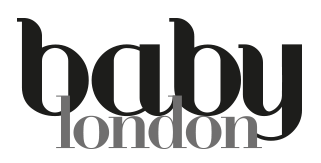 The Safer Sleep Charity, The Lullaby Trust, states that to conform to safer sleep guidelines a baby’s bedroom should be between 16 and 20C at night. Whilst this is relatively easy to adhere to in the winter with the use of a thermostat, in summer it’s significantly more difficult but the use of fans and iced water bowls can help. And when it comes to bedroom design you should also take temperature into account. Don’t plan to have your baby’s cot next to a radiator or in direct sunlight as this can lead to overheating. Likewise sleeping next to a window can get rather chilly in the winter. And finally, what should the bed itself look like? For a newborn, the answer is BORING! For the first year there should be nothing in the cot with your baby, not a thing. No bumpers, no pillow, no duvet, no entire zoo of cuddly toys…. just your baby and the blankets or sleeping bag that they need to keep warm at night (and dummy if you choose to use one). If you choose blankets they need to be tucked in under the mattress and come up as high as their armpits in order to prevent them pulling them over their head and overheating. The same goes for a canopy over the cot, for a newborn this is a no-no. Once your baby gets a little older then you can introduce any of these things, but I always advise parents to continue with a sleeping bag and cot rather than duvet and bed for as long as possible in order to aid a full night’s sleep for everyone. Natalie is a certified child sleep consultant and a mother to three young boys. She is passionate about sleep and the benefits to the whole family that a great night sleep brings. As well as running regular sleep workshops in London and the South East, Natalie works one-on-one with families to help them achieve their sleep goals with her supportive and calm approach.